Miami Marlins pitcher Dustin McGowan with several of his All Stars during a game experience in late June this season. When you live with something like Type I Diabetes, even normal, daily tasks have their challenges. Patience and discipline are required in order to manage the way your body affects the life you live, and your health does not always allow you to enjoy things the way you want to. Sometimes it can feel impossible. Miami Marlins pitcher Dustin McGowan helps to prove that Type I Diabetes cannot stop one from realizing their big-league dreams. The veteran hurler and Type I diabetic takes great pride and honor every time he takes the field for the Marlins, as he represents all those who face the same challenges with diabetes. McGowan champions the drive to overcome, and since joining the Marlins last season he has continued those efforts here in the South Florida community. 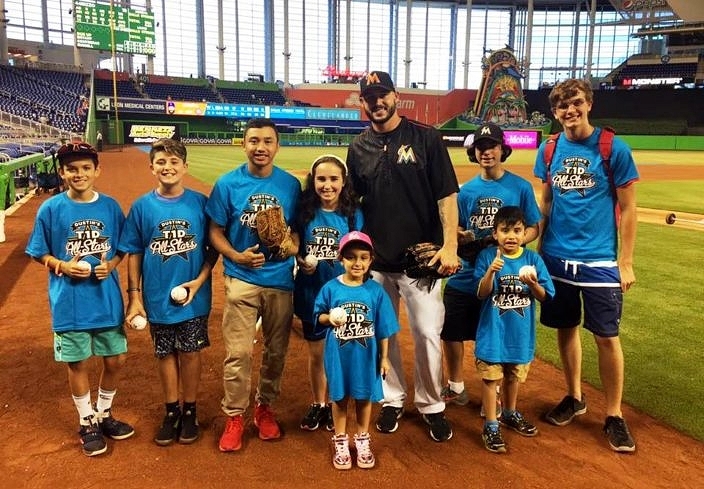 Thanks to the Marlins and the Diabetes Research Institute Foundation, this season McGowan has been able to offer even more for his fellow fans that also suffer from diabetes. 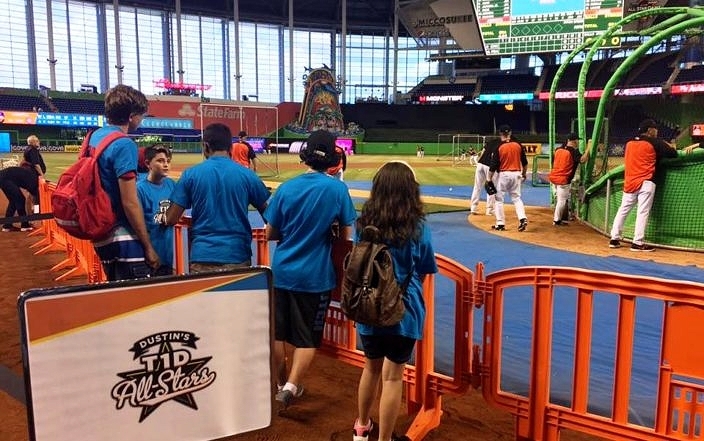 Through a special promotion called Dustin’s T1D All Stars, local children afflicted with Type I Diabetes, along with one parent, have been invited to attend select games for a special night with McGowan and the rest of the Fish. Attendees meet Dustin and his family and attend the game with free parking and free tickets as his personal guests, they enjoy batting practice down on the field, learn something informative about diabetes from experts and receive a complimentary T-shirt. Dustin’s T1D All Stars take in Batting Practice before the game. So far this season, dozens of families has enjoyed the incredible experience they will remember forever over three different games, with families coming from as far away as Massachusetts and Kentucky, as well as Florida. There are two more future events still coming on August 31st and September 28th, and on the last of which McGowan will also be making a donation from his program to the DRIF. While the overall experience at the ballpark felt down on the playing field is an unforgettable memory, it is the opportunity to engage and educate guests about diabetes that matters most. Following batting practice on the field, guests converge in front of the clubhouse for expert speaker series. There is always a presenter for the adults and then a presenter for the kids, which usually entails an activity that helps them engage with the other kids in the program. Also participating in the children’s activities is McKensy McGowan, Dustin’s oldest daughter whom suffers from Type I Diabetes as well. The McGowan family has tackled the challenges diabetes bring as a team, and it is just as enriching for them to enjoy these events together with fellow families in the community. The McGowans meet and chat with some of their All Stars at Marlins Park. Dustin and his wife, Jilly, forged an immediate bond with the Diabetes Research Institute Foundation. When the family first arrived in South Florida last season when McGowan was traded to the club, McKensy noticed the DRIF logo on top of their building at the University of Miami campus, and the family quickly arranged a special outing. The entire family visited the facility and spent time with other families there, which forged an immediate friendship with Karlya and other members of the foundation, and which also set the stage for the T1D All Stars. The educational component leaves families better armed going forward, and perhaps even with better information than something they may have previously known. Topics this season have included: how to make an easy dessert that is T1-friendly, fathers discussing the challenges in dealing with diabetes, back-to-school hints and tidbits in managing diabetes and learning about how to gauge Glucose and AIC Numbers. Through the course of the events the children have asked excellent questions and have shown how helpful those answers are by the way they now apply the information to their treatment and management. Typically this sort of experience happens in a hospital environment, which does not bring the same sort of joyful memory association for the children. 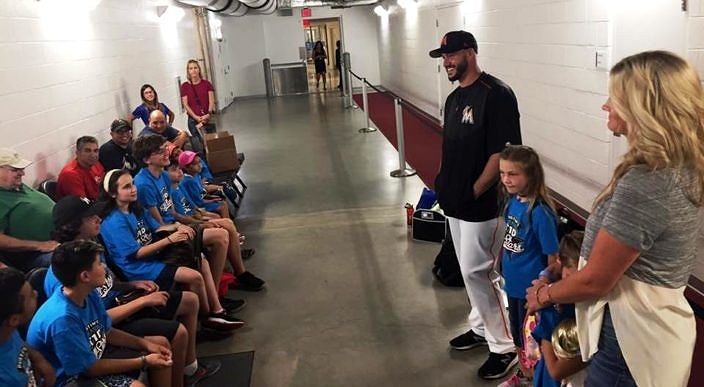 This is a family experience directly shared with McGowan and his own family, and is just another example of the type of community leadership the 10-year veteran has brought to the Marlins. In January McGowan also became the only Marlin to ever be awarded the Hutch Award, for his contribution to the diabetes community. The Hutch Award is awarded to the Major League Baseball player who best exemplifies the fighting spirit and competitive desire of Fred Hutchinson. Previous winners include Mickey Mantle, Sandy Koufax, Johnny Bench, Carl Yastremski, Craig Biggio and Pete Rose.